Kentucky football got a terrific athlete when Western Hills star Wandale Robinson committed to coach Mark Stoops’s team over Nebraska, Alabama, Ohio State, Purdue and Michigan last week. But Kentucky also got a huge boost for in-state recruiting when Robinson reversed a three-year trend of the state’s top players picking out-of-state schools. Robinson decided he wanted to be what former UK offensive coordinator Neal Brown called a “hometown hero” and play for the state school knowing it could have lifetime benefits for him. He also knows UK has a need for a player like him. The Cats have one — receiver/returned Lynn Bowden who had a punt return touchdown and 13 catches for 166 yards in a win over Missouri just five days before Robinson made his commitment to Kentucky. The 5-9, 185-pound Robinson is the likely Mr. Football winner. He probably will be the Gatorade Player of the Year as well as the Paul Hornung Award winner. His numbers are just too overwhelming to see anyone else beating him. His team lost 78-74 at Lawrence County last week to end his prep career, but he had 405 total yards and 34 points. He ran 13 times for 129 yards and two scores, caught nine passes for 282 yards and two touchdowns, returned two kicks for 44 yards and had five two-point conversions. He also had 14 tackles, including one tackle for loss. That meant he finished his Western Hills career with 6,795 yards and 97 touchdowns rushing. He caught 102 passes for 1,837 yards and 21 scores. He completed 15 of 22 passes for 330 yards and three touchdowns. He had eight kick return touchdowns (five kickoffs, three punts) and 806 career points. He led the state in rushing, touchdowns and points scored this year and was third in total yards — the only non-quarterback in the top 10 in total yards. On defense, he had 268 career tackles, nine interceptions, eight fumble recoveries and four quarterback sacks. He was second in the state in total tackles this year. Miller also explained that Robinson’s decision was not easy and that he agonized over the pros and cons of his six final schools. Woodford County coach Dennis Johnson, a former all-SEC defensive lineman at UK, said Robinson reminded him of former UK star receiver/returner Craig Yeast except Robinson is more muscular. Garrard County coach Jerry Perry, a Western Hills alum, prides himself on defense. He said Robinson, a safety, impacted what Garrard even called on offense. “It’s crazy to call your own offense based on where a 5-9, 185-pound guy is lined up. I even spent a timeout in our game because he lined up in a certain spot,” Perry said. “He is by far the best all-around football player that I have seen in Kentucky. More importantly, he has accomplished so much with one school. He easily could have moved to some larger high schools and enhanced his chances to win state titles, but he stuck it out with his buddies. Robinson is one of 100 players selected to play in the All- American Bowl Jan. 5 in San Antonio. That’s just one more reason for youngsters in Frankfort and Franklin County to look up to Robinson, who mentors middle school students. “I want to be a person kids can look up to and be like. That has always been my thing since I started getting offers,” Robinson said. That’s why he chose to make his announcement at his high school gym so every Western Hills student could attend along with family and friends. Johnson said not all players with exceptional talent also earn respect with how they play. Robinson does. Former UK All-American Dan Issel has been working for over a year with a group hoping to bring a NBA team to Louisville. He was a two-time All-American at UK, Kentucky’s all-time leading scorer, ABA Rookie of the Year in 1971, sixtime ABA All-Star and one-time NBA All-Star. However, Issel knows expansion is coming. An ex-NBA administrator recently told him expansion would happen. Currently NBA teams are “flush” with cash due to the recent TV contracts and must share half that money with the players. Issel said that’s why former UK star Karl-Anthony Towns signed a six-year, $190 million deal with Minnesota. “The NBA has to spend that TV money on salaries,” Issel said. “But the owners are always looking to make more money. It may cost a billion to 1.4 billion (dollars) for an expansion franchise and that goes directly to the owners’ pockets. They don’t have to split that with the players. A group of Louisville community and business leaders has committed about $3 million to bringing a team to Louisville. Issel said with the expanded timeline more money is needed and fundraising projects will be held in the upcoming year to help offset costs. 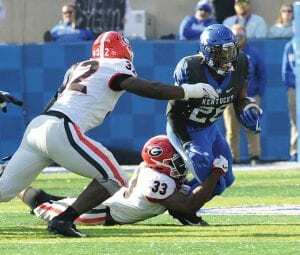 Georgia beat Kentucky but that doesn’t mean Georgia coach Kirby Smart, a former defensive coordinator at Alabama, is not impressed by UK linebacker Josh Allen. “He’s faster. He’s bigger. He can strike, play the run. He can drop, play and coverage. They move him around. They do a great job using him,” Smart said. “He’s the total package. He’s not one-dimensional. He can do a lot of things. He’s very disruptive. You gotta know where he is at all times. He’s what you want when you design a threefour defense. Beating Georgia would have been fantastic. Make no mistake about that. But even though it did not happen, there’s still a great chance for Kentucky to have a historic season. Win at Tennessee and end a 34-year losing streak in Knoxville. Win at home against Middle Tennessee in what will be Josh Allen’s final home game and likely will be Benny Snell’s. Close the regular season by adding to Louisville’s misery. That would give UK 10 wins for the first time since 1977, allow the Cats to finish second in the SEC East and keep UK in the top 20. It would mean UK won at Florida, Tennessee and Louisville in the same season — something that has never happened. “Tough loss for the Cats. This can still be a very special year for them so let’s stay behind them and see what bowl they get at the end,” former UK coach Rich Brooks tweeted after the Georgia loss. He’s right. Win these next three games and Kentucky could get a spot in the Citrus Bowl Jan. 1 in Orlando. What UK fan wouldn’t take that? Don’t forget that Snell needs 403 more yards to become UK’s all-time leading rusher with 3,835 yards. He’s had three straight 1,000- yard seasons and needs to average 135 yards per game in the three regular-season games to break the mark or 102 yards per game if you count the bowl game. He’s had just 100-yard game (169 against Vanderbilt) in the last five games. Tight end C.J. Conrad, who had a costly fumble against Georgia, felt the team let fans down last week and said it won’t happen. Quote of the Week: “I know we’ll win out. The thing about this team is that we’re not going to give up. We have to continue to play hard and just keep getting after it. We can’t get complacent and don’t get lazy and just stay united as a team and we’ll be fine,” quarterback Terry Wilson after UK’s loss to Georgia. Quote of the Week 2: “College basketball has always been a cesspool. This is a tough, hard business. Not everybody cheats. Some cheat a little bit, some cheat a lot. You have got to find your groove I guess,” former UK All-American Mike Pratt on cheating in college basketball. Quote of the Week 3: “If you’re rocked by someone whether it’s a coach or fan or someone on Twitter saying that you stink or you’re not very good, your confidence is going to be rocked. He’s really worked hard. He’s confident, he’s smiling, he’s bouncy. He’s going to be a guy that’s going to be a factor for us if we’re going to be the team we want to be,” Kentucky assistant coach Joel Justus on sophomore center Nick Richards.